The US Microsoft Store has just posted a new hardware offer. 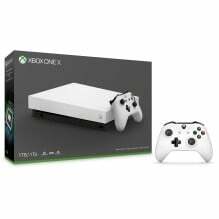 The Robot White Xbox One X is still $499.99, but now you get a second standard Xbox Wireless Controller thrown in for free as well as a copy of Gears of War 4. You can choose either black or white for the second Wireless Controller, and the bundle will throw in a month of Game Pass and 14 days of Xbox Live as standard as well. When building the bundle, you can also get $10 off the more expensive controllers in Microsoft's range, including the Elite controller and the various official colours and themes. You can also get $10 off 3- and 12-month Xbox Live Gold subscriptions. The deal is available now and at present has no deadline.